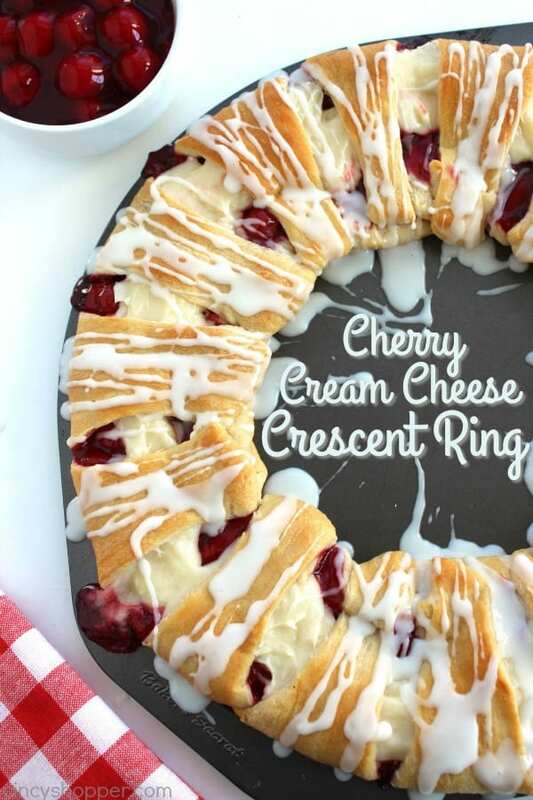 After making our Cherry Cream Cheese Crescent Ring, I was determined to make another quick and easy cherry crescent dessert. 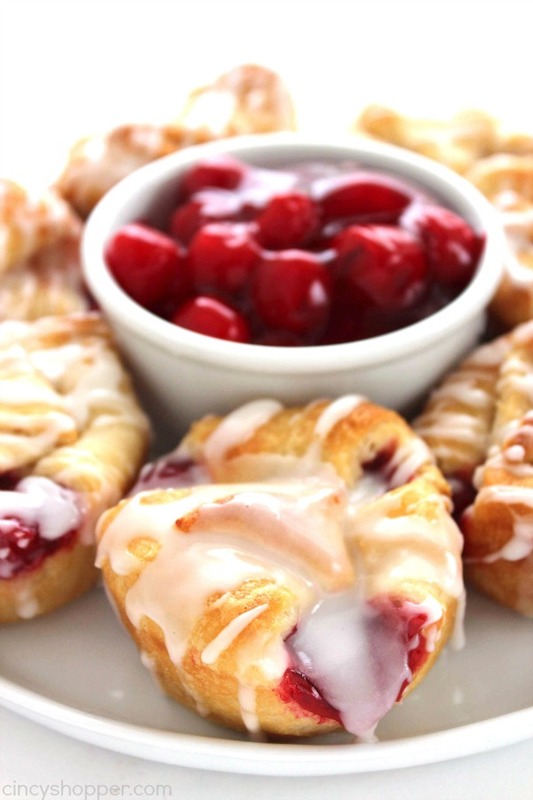 My family loved the combination of the flaky crust, cherries, and sweet glaze. 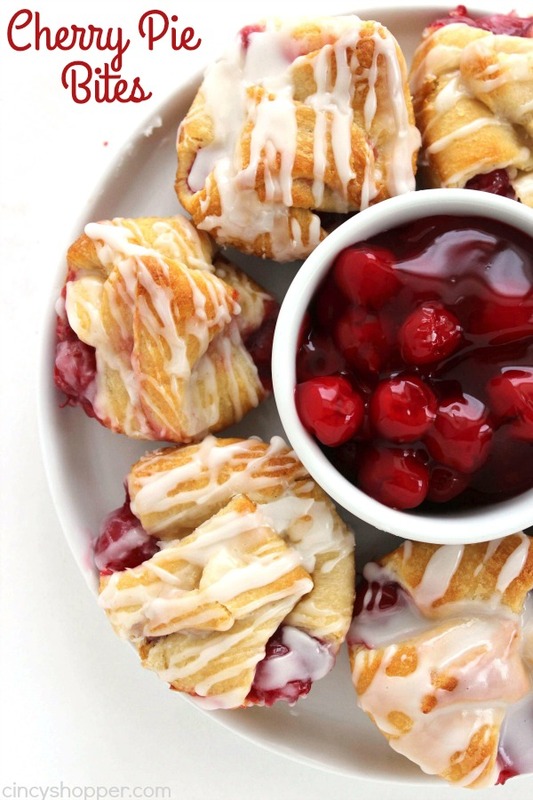 After spotting these Apple Pie Bites over on Parent Pretty, I just knew I needed to make us a cherry version. 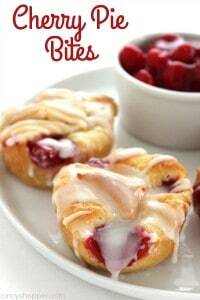 I made a couple batches and they were perfect for placing in the freezer to heat on busy mornings. 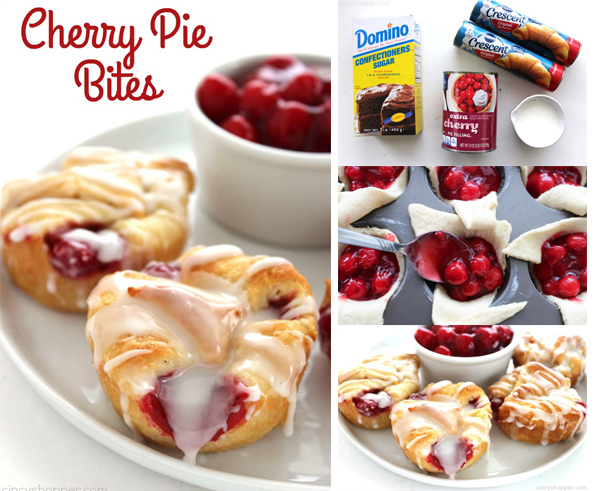 I did not add cream cheese to these sweet little “pies” as I knew the cherries and crust with glaze would be enough. I considered adding cream cheese but they were perfect without. Since these were so easy, I had them in the oven within a few minutes time. I love everything quick and easy and these meet both of those qualifications. The red cherries are so super colorful. 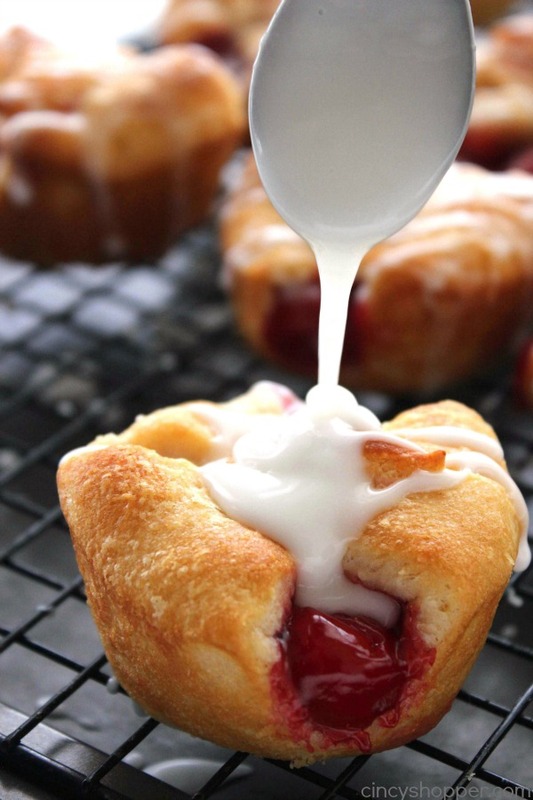 The glaze makes them a bit decadent looking. PERFECT. 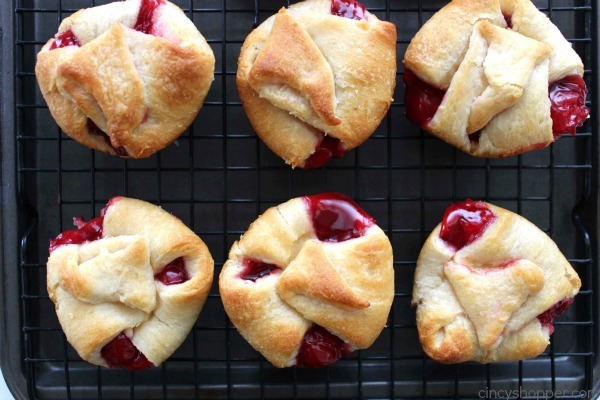 All that is needed to make these muffin tin Cherry Pies is some store bought crescents, cherry pie filling, confectioners sugar, and a splash of milk. 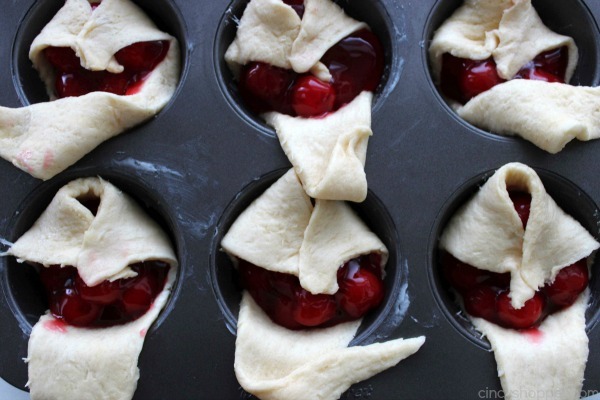 Perfect for making for a large crowd at holiday times too! 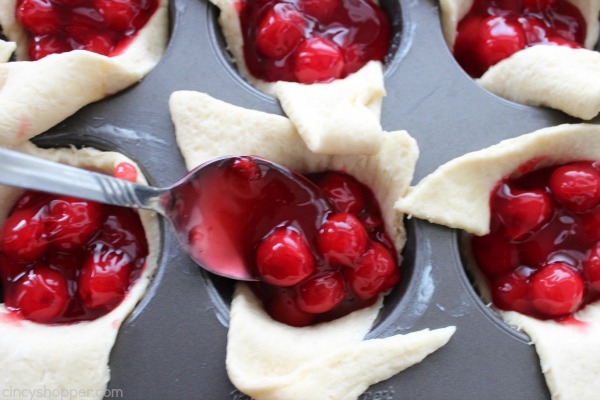 Place one triangle into each cup and fill with a tablespoon of pie filling (you can load them up, and it will not hurt a thing). 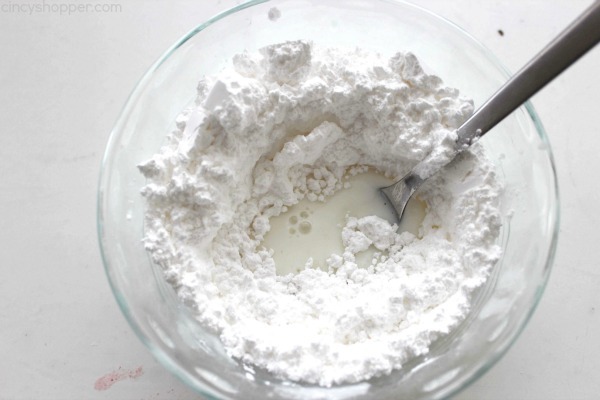 Whisk together powdered sugar and milk until smooth. Transfer cooled bites to wore rack and drizzle with glaze mixture. 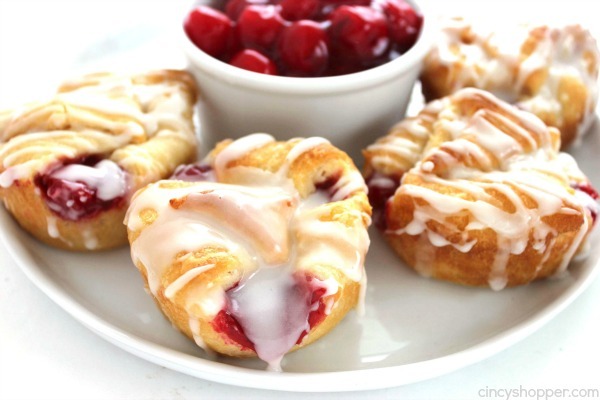 Do you have a favorite crescent roll recipe? 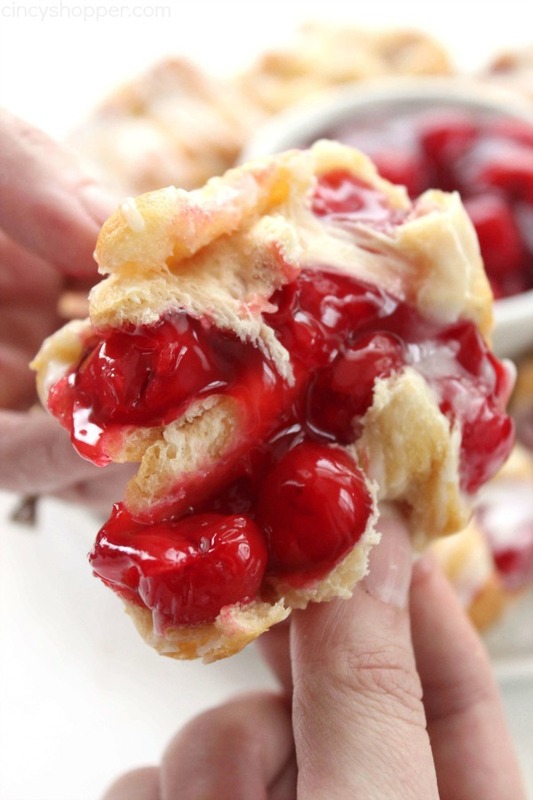 I love this delicious easy to make cherry dessert. 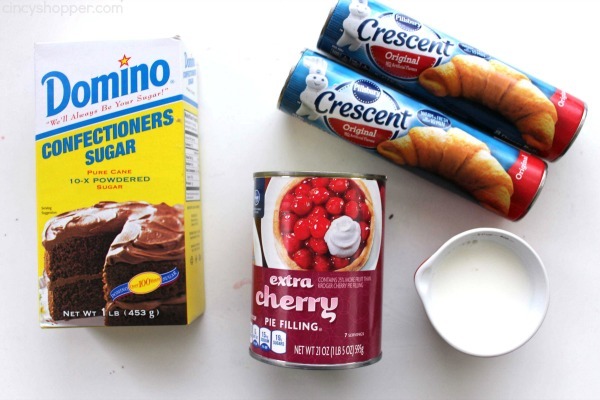 I could whip up these cheery dessert now because I have crescent rolls and cherry pie filling. YEAH! Love this recipe!!! My only problem is HOW to move them from cupcake pan to wire cooling rack!!! Lol!!! 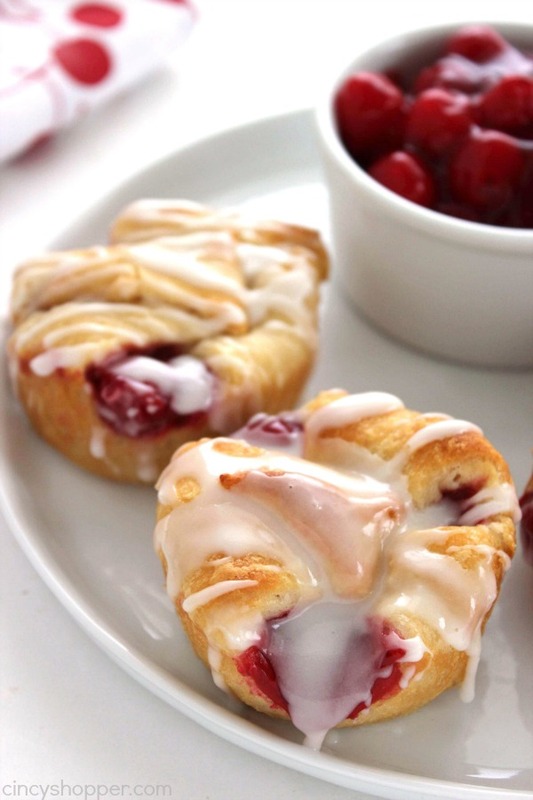 THANKS for posting this RECIPE!!! Tried these tonight. 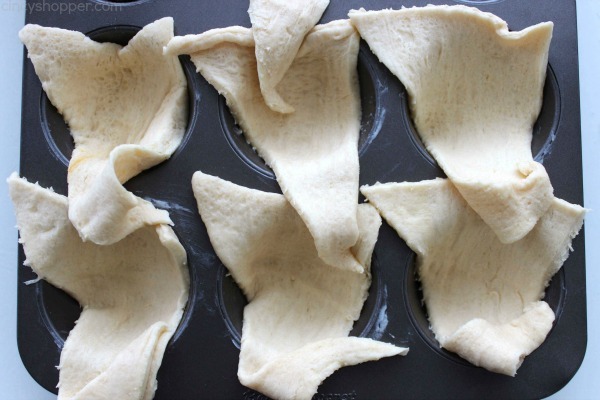 I used Pillsbury crescent rolls which were inconsistent in size and shape. 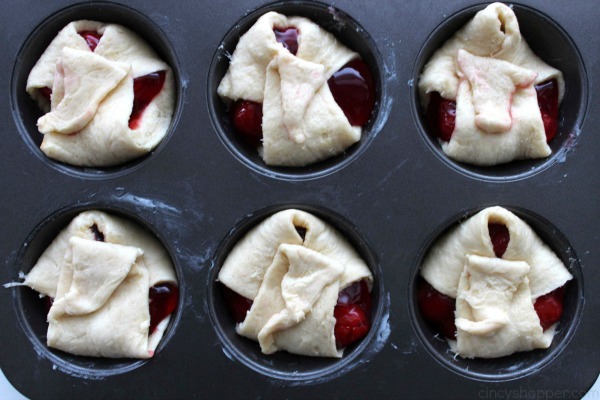 If you can just use the thicker ones and make the thinner ones into something else or even just baked rolls that might be a good idea. So, you will need more than 2 pigs. 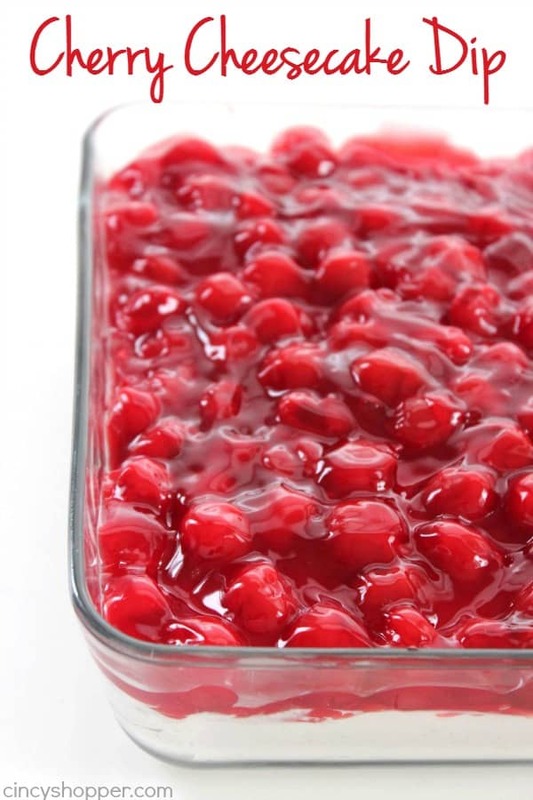 Make sure the bottom is completely covered and as much of the sides as you can. This will make it alot easier to get out of the pan without it falling apart. And if you can leave it in the pan at least 5 minutes that will help too. In the end, I put them in cupcake papers and some used forks. Delicious but not a total win or fail. I did not have a problem with the bottoms not cooking and the tops were a nice golden brown. I made these for my dad for Father’s Day yesterday, and he LOVED them!! 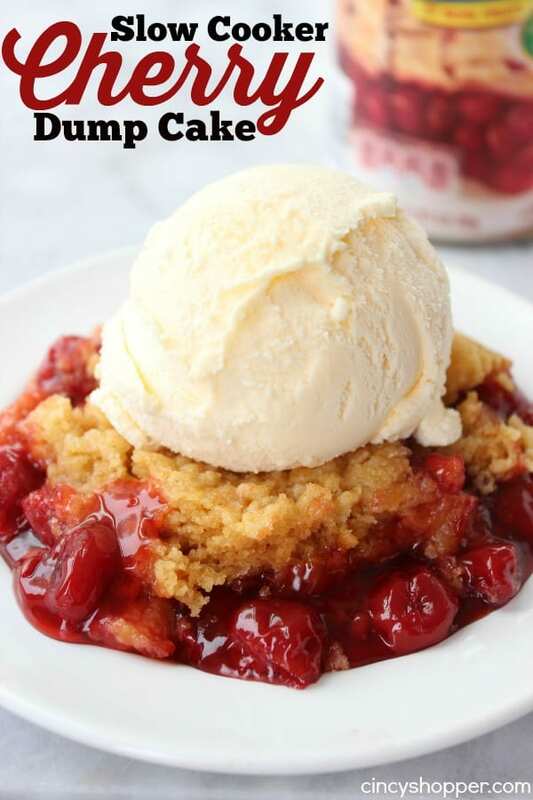 This is an excellent recipe!! Thank you SO much for sharing it. I will definitely be making them again, SOON!! ? These look amazing!!! Perfect for any holiday or occasion!